Pistes-Solidaires hosted 7 volunteers in Pau for 3 weeks, within the Senior Plus framework. Coming from Latvia, Portugal and Italy, these European volunteers took part in various activities with local associations. They discovered together social practices, educational activities and common initiatives. The Portuguese volunteer was unanimously adopted in the retirement house where he developed some activities; his smile and his perfect knowledge of French was greatly appreciated by the residents. The agricultural talents of his Latvian colleague, Nikolaï, were valued in the garden of this retirement house, as he got involved in the establishment of new plants. The volunteers participated in familial activities with organisations from a community center in Pau; during the cooking workshop, the Italians made the biggest tiramisu ever cooked in Pau, for 70 people. Through their participation, the European volunteers got acquainted with the French social system and its organisation in the territory. 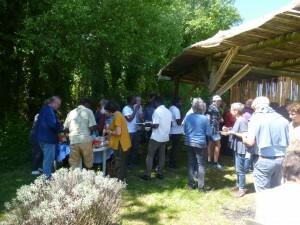 In the Parcelles Solidaires, community garden in Pau, their participation was greatly appreciated. To weed, to harvest, to make seeding, all these activities could be done without knowing the French language as they are commonly practiced everywhere. Thus, it is possible to notice the different techniques of earthing up the potatoes or propping the tomatoes, depending on the countries. The integration of the group was facilitated by one of the members of the community garden who was also taking part in a mobility through the Senior Plus project. She organised spontaneously a giant picnic, with about sixty people, on Sunday, under the hut of the community garden. The first songs started to ring just after the aperitif, Italian, French songs. The Latvian and the Italian were hosted in Ferrières, village near the Pyrenees, where a band of local accordionists played music and entertained the participants. In the same way, there was no need to speak another language to start learning Bearnese dances, as all local dances have the same pattern: to make connections between the people, to enjoy the energy of the partner or its firmness. Lunch was taken together in the public building of the village, mixing Mediterranean flavours, Latvian recipes and local products. Two French seniors, coming back from their mobility in Rome, shared their experience of voluntary work towards migrants in the Garibaldi cooperative. Throughout their stay, the 7 European volunteers enjoyed full and intense activities in Pau. They experienced a human cooperation, on the field, where everybody discovers and changes its way of seeing things. A personal development, in a way. Posted in: Notizie Senior-Plus This entry was posted on Friday, July 28th, 2017 at 3:57 pm You can follow any responses to this entry through the RSS 2.0 feed.